Capital One is one of the last big banks holding out as everyone else (even tiny regional banks) gets on board with Samsung Pay and Android Pay. Today, it takes a step in the right direction. 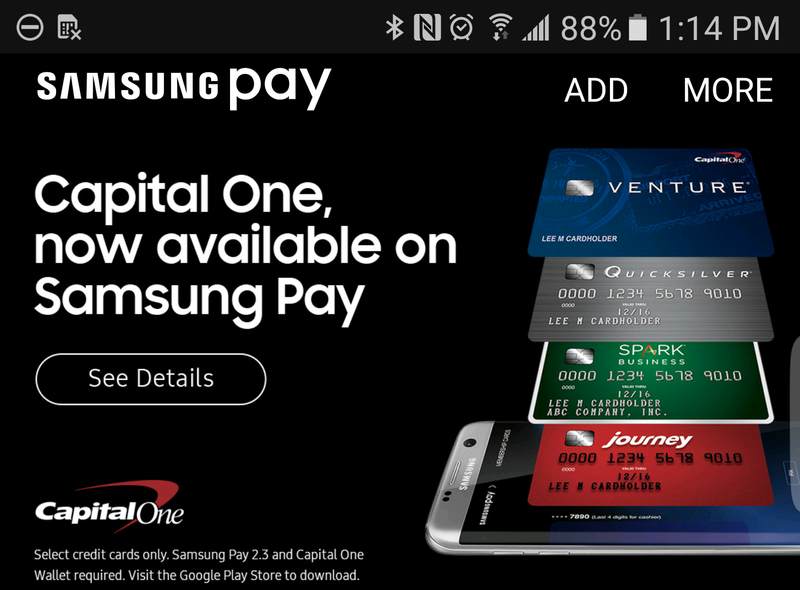 An update to Samsung Pay is rolling out that adds support for some Capital One credit cards. The setup process is a bit of a mess, which I suspect is a result of concessions made to Capital One to get it on board. In order to add the cards to Samsung Pay, you'll need to have the Capital One Wallet app installed... which also does mobile payments. This is how you activate the card in Samsung Pay. This adds the ability to do MST payments at non-NFC terminals (Capital One Wallet is NFC only). Not all cards are supported, but you can check the full list here. You can use Capital One cards like Venture One, Spark, and Journey. No debit cards right now, though. There's still no sign of Capital One support on Android Pay, which was listed as coming soon when the service first launched. Maybe now that Samsung has support, Google won't be far behind.